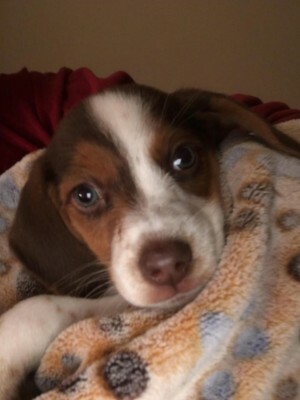 Poynette, WI – Late September, Doobert volunteers drove a nameless Beagle puppy to its new foster home in Poynette, WI. This little female pup transferred to Adams County Humane Society in Friendship, WI from another shelter at four and a half weeks old. She was very small and only weighed 4.3 pounds. Adams County Humane Society contacted ARF German Shepherd Rescue in Poynette, WI. In order to transport the pup, ARF German Shepherd Rescue set up a transport through Doobert.com. Enough volunteers signed up to transport her within 24 hours. Since she is still a puppy, she needs to learn manners and adjust to her new home. She will be ready to adopt within the next couple months. Now, she just needs a name! Facebook users can submit their name ideas on Doobert’s Facebook. Users will then vote and the winning name will be picked for this loveable pup! Thanks to these amazing volunteers, this little girl has a great life with her foster family and just needs a name and a family.